Shout! Factory, a multi-platform media company, and Hasbro Studios announced a strategic distribution collaboration to bring the iconic animated feature, Transformers - The Movie to the home entertainment marketplace in the U.S. and Canada. This full-length animated adventure boasts the voice talent of Orson Welles in his final role and an all-star voice cast that includes Peter Cullen, Eric Idle, Casey Kasem, Judd Nelson, Leonard Nimoy, Robert Stack and Frank Welker. 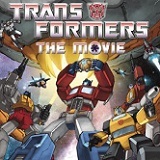 Action-packed animated feature Transformers - The Movie chronicles the heroic efforts of the Autobots as they defend their native planet Cybertron from the evil Decepticons and Unicron. The Autobots, led by the heroic Optimus Prime, prepare to make a daring attempt to retake their planet from the evil forces of Megatron and the Decepticons. Unknown to both sides, a menacing force is heading their way –Unicron. The only hope of stopping Unicron lies within the Matrix of Leadership and the Autobot who can rise up and use its power to light their darkest hour. Will the Autobots be able to save their native planet from destruction or will the Decepticons reign supreme? Los Angeles, California – June 9, 2016 – Shout! Factory, a multi-platform media company, and Hasbro Studios announced a strategic distribution collaboration to bring the iconic animated feature,TRANSFORMERS – THE MOVIE to the home entertainment marketplace in the U.S. and Canada. This full-length animated adventure boasts the voice talent of Orson Welles in his final role and an all-star voice cast that includes Peter Cullen, Eric Idle, Casey Kasem, Judd Nelson, Leonard Nimoy, Robert Stack and Frank Welker. The announcement was made today by Shout! Factory’s founders Richard Foos, Bob Emmer and Garson Foos; and Hasbro’s Executive Vice President and Chief Content Officer Stephen Davis.